There's just something that happens around the beginning of September. I get a strong urge to fill my freezer with comfort food and warm casseroles. Freezer cooking is a staple at our house. Between homeschooling, work, and other responsibilities, I like to save time where I can. So a freezer full of prepped ingredients or ready-to-prepare meals is an important part of our meal planning routine. 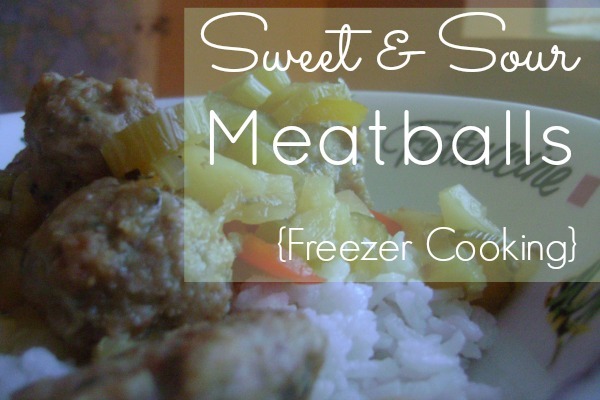 This recipe for sweet & sour meatballs is one of the few cook-ahead meals that we like. I prefer prepping ingredients and meals but not putting fully cooked meals in the freezer. But these meatballs, even though fully cooked ahead of time, still taste hot and fresh on cook day (no bland reheated leftovers for us!). There are two parts to this recipe - the meatballs and the sauce. You could choose to just make the meatballs, freeze them, and thaw and make the sauce the day that you want to eat them. Or you can cook both ahead, combine in a freezer container, and reheat in a saucepan when you're ready to eat. Because my goal with this meal is to have something I can heat up and serve quickly, I choose to do all the steps at once before cooling, packaging and freezing. So, when I want to serve I make some rice, saute some stir-fry veggies, and reheat the meatballs. Dinner is on the table in about 20 minutes. For the meatballs: Combine the pork, bread crumbs, red pepper (more or less to taste), salt, eggs, milk, and onion. Shape into small meatballs (makes about 60 meatballs). Preheat the oven to 350. Heat a large nonstick frying pan over medium-high heat. Add the meatballs in batches, browning on all sides (about 10 minutes). Remove the browned meatballs to a cookie sheet. When all the meatballs have been browned put them in the preheated oven for 10 minutes or until they are cooked through (160 degrees). Allow the meatballs to cool before dividing them between 3 freezer containers. For the vegetables: Drain the fat from the frying pan, leaving about a tablespoon. Add the onion, celery, and bell pepper to the pan (cooking in two batches, if necessary). Saute until the vegetables are slightly softened, about 6 minutes. Add the garlic and ginger and cook about 1 minute longer. While the meatballs and vegetables are cooking, prepare the sauce: Drain the pineapple, straining the juice into a large measuring cup. Add enough water to the juice to equal 2 cups. Add the vinegar, honey, soy sauce, and cornstarch, whisking well. Divide the vegetable between 3 freezer containers and place the frying pan back on the stove. Pour the sauce into the pan and, whisking occasionally, bring to a simmer. When it thickens, remove it from the heat and allow to cool. Once it's cooled, divide it between the freezer containers. Divide the pineapple chunks between the three containers as well. 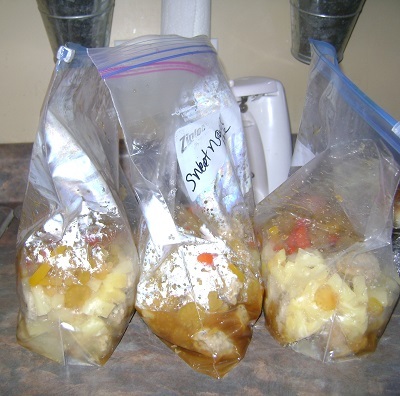 Finished freezer bags should include: pineapples, meatballs, vegetables, and sauce. Seal and freeze flat (if using freezer bags), thawing before recooking. To reheat: Pour the contents of a thawed freezer container into a large saucepan over medium heat. Reheat and serve with rice and stir-fry vegetables.